Balloonfishes, Porcupinefishes: Prone to Blowing Up! Balloonfishes (diodon holocanthus) are smaller than porcupines, usually 8 to 14 inches in length, somewhat mottled with black and shades of tan. They’re notable for, in non-inflation mode, having obvious spines that lie flat along their bodies. WHEN YOU SEE PHOTOS OF PORCUPINEFISHES AND BALLOONFISHES, they’re often inflated like stuffed pincushions. But the truth is that recreational divers who are minding their manners are unlikely to see them in a puffed-up state (Note to wiseguys seeking to initiate inflation: leave them alone). But, they’re different species, and the ones that have the more obvious spines are the balloonfishes, not the porcupines. Spines increase their deterrence to predators (in 2017, a lemon shark in the Maldives made the news by suffocating to death when a porcupine got stuck in its gullet; unfortunately, it didn’t end well for the porcupine, either). 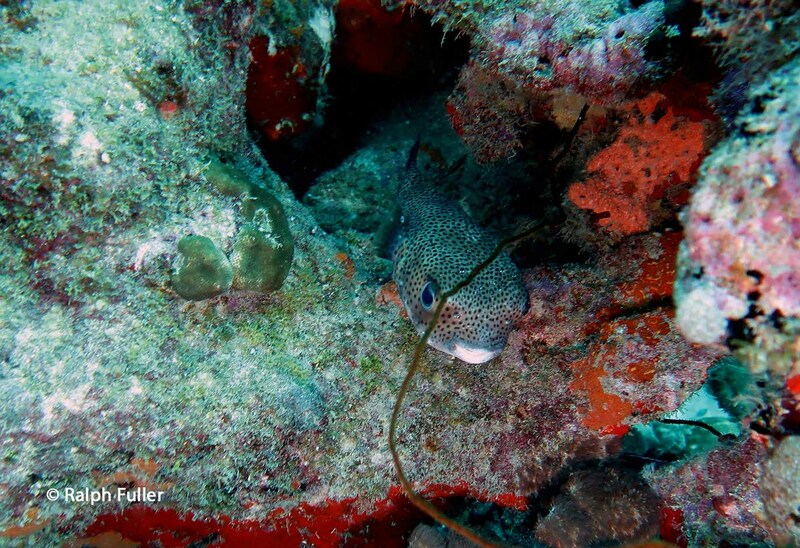 Porcupinefish – small spots all over body, less prominent spines. It should be noted that while porcupines and balloons are often referred to as “puffers,” there’s a separate group (Tetraodontidae) that actually is the “Pufferfish Family,” fishes that can also inflate themselves but lack spines, like the sharpnose puffer and goldface tobies in the Caribbean and numerous species of tobies in the Indian-Pacific basin .They’re fishes for a different discussion. 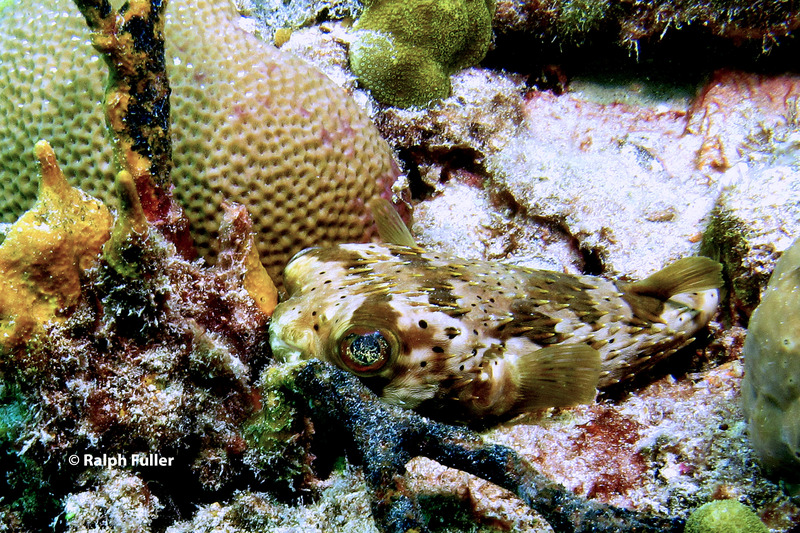 Goldface tobies are a commonly seen pufferfish in the Caribbean, third cousins to porcupines and balloons. Inflatability: Porcupinefishes and balloonfishes can inflate themselves because they have elastic stomachs they can fill with water, swelling their bodies as much as three times their uninflated size. This capability comes with an adaptation: their stomachs have lost their digestive function, which takes place in their lower intestines. The action of inflation causes porcupines’ and balloons’ spines to become erect. Feeding: Because their foods of choice include hard-shelled creatures like snails, hermit crabs and sea urchins, they have fused teeth and powerful jaws that can crack shells. Reportedly, divers who have tried to handle them (don’t do this!) have found out that their powerful jaws are strong enough to break fingers. 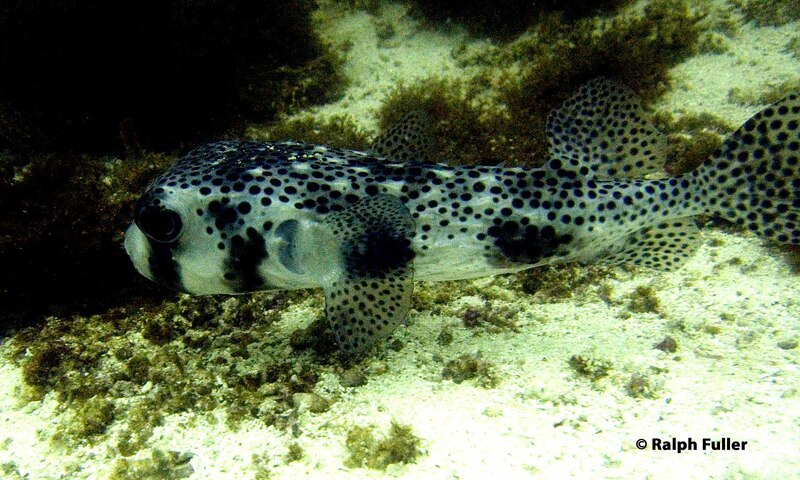 A variation on porcupinefishes are spotted burrfishes (this one photographed in the Galapagos, although their distribution is worldwide). Their triangular spines are permanently erect. Porcupines and balloons are described as nocturnal but it’s not unusual to see them during the daytime. 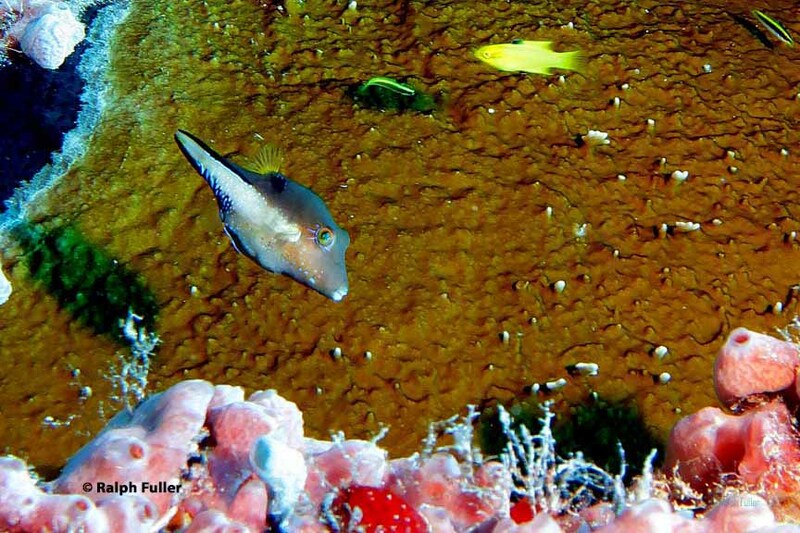 They’re often described as solitary fishes that hang out in holes or under ledges, but it’s also not unusual to see them in the open. Their large eyes, which often appear to be emerald blue, are a bonus for nighttime foragers. Toxicity: No discussion of puffers would be complete without talking about the risks of poisoning – potentially fatal – caused by tetrodotoxin toxins found in the flesh of some puffers. 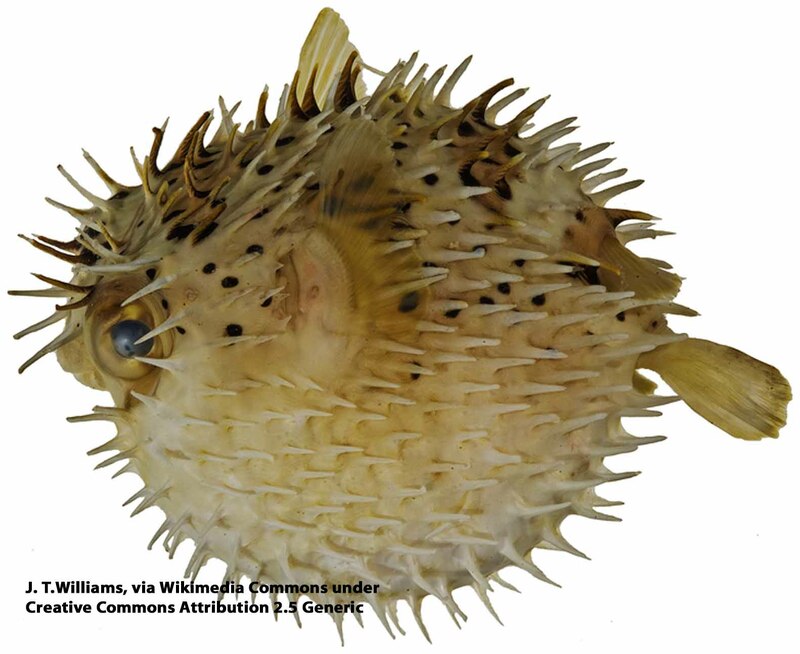 Naturally, the risk makes gourmands in Japan and other societies consider puffers to be a delicacy called fugu. This is different from ciguatera poisoning, resulting from an accumulation of dinoflagellates that is sometimes found in many species of fishes. 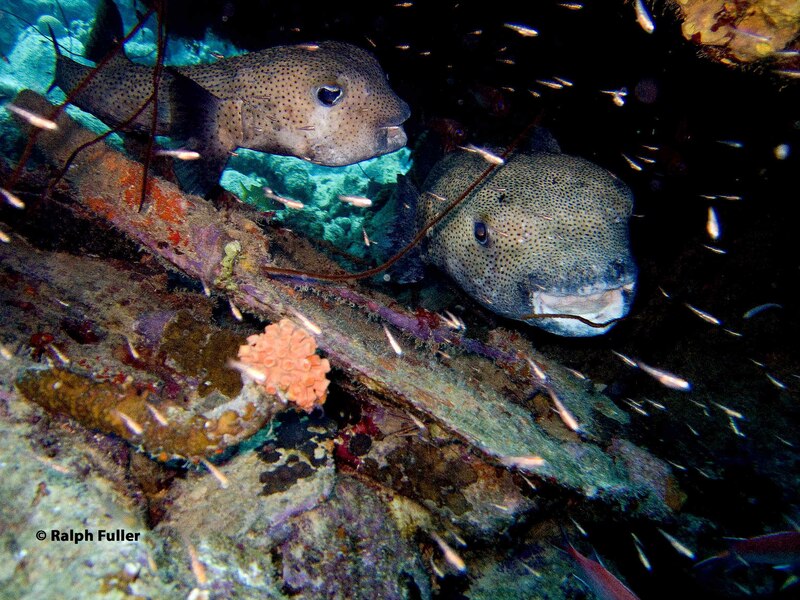 Although porcupines and balloons are generally solitary, this pair was spotted underneath a wreck in Bonaire. The one at right was some 3 feet in length.